No game is complete without good food, and even better friends. When you can't grill for them, you can send snacks to tide them over. 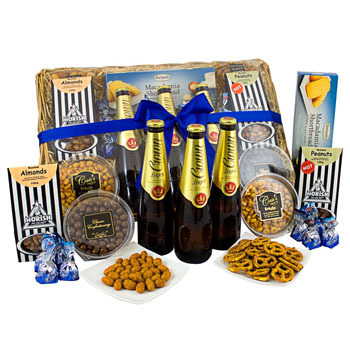 Your recipient will receive 3 bottles of Crown Lager Beer, a box of Caramel Coated Almonds, hot and spicy Peanuts, sweet Macadamia Shortbread Cookies, crunchy Pretzels, and so much more. Kick off the season, invite your friends, or thank your host with Beer for Buds. Please note: The brands may vary depending on delivery location.